Tiggi’s Restaurant in Clayton-le-Dale has raised £540 for East Lancashire Hospice by raffling a £140 easter egg that they had transported from Italy. The 3 feet high egg is made from hollow milk chocolate and the lucky winner will receive a mystery gift inside the chocolate egg – as this is traditional for eggs in Italy. The egg cost about £200 to have it shipped over and the costs of the egg and transportation were paid for by Tiggi’s, so all the raffle money raised goes to the hospice to care for patients and their families. Raffle tickets were sold at £1 each and the winner has been informed. 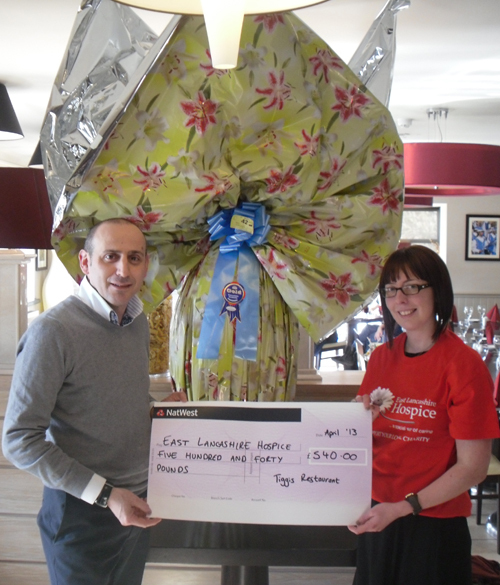 Gianfranco Parissa (l) hands over the cheque to hospice fundraiser Kimberley Hall in the shadow of the huge egg at Tiggis.